I feel quite embarrassed that I read the pop lit dystopian books before this almost canonical work of the genre (it wasn’t required reading when I was in high school and in my Masters). I had long wondered what it was about, and because the film adaptation made its casting for the film this year, I grabbed a copy and read it and marveled at how The Giver is light years away from its predecessors in this category. Pop literature dystopia now tends to focus more on the physical/combative survival of its protagonists. After Suzanne Collins’ The Hunger Games comes Veronica Roth’s Divergent, both plots Darwinian and hero-centric in nature and both angled with a romantic story for teens. On the other hand, in The Giver, our twelve year-old protagonist named Jonas is initiated into a difficult responsibility for his community. As a “Receiver of Memory,” he is privileged (subjected) to experience a heightening of senses in this faux utopian society. The difficulty in the situation is that Jonas is the lone person not exempt from “Stirrings” or the human condition, and the overwhelming influx of emotions he experiences burns him out physically and emotionally like his Giver, an aged man required to carry the burden of a whole society. Unlike majority of the populace who are aided by hormonal/chemical pills to suppress any kind of emotion, Jonas and the Giver carry the weight of the so-called impurities in their world, a world trying to maintain a “sameness”. Those who defy the community’s rules are “released,” an innocent term with a dreadful truth. It’s a powerful and timeless text that will surely shake the reader out of numbness from the mindless routine of the world. Sounds like nothing of the mainstream dystopian idea, right? This award-winning book’s reception from parents and educators are met with A LOT of caution. Discipline and order is challenged in the world of Jonah, while strict formative ways of a child’s upbringing is tradition in certain cultures in real life. I do think adults should not worry about exposing their children to dystopian literature as long as there’s ample guidance and discussions on how this text is relevant in understanding emotions, desires, memories, and being human in this complicated reality. We adults have fashioned ourselves based on what we were. More often than not, it is the most painful experiences that push us to our greatest metamorphosis. Jonah’s rite of passage was just that, and his choice to be what he wanted to be was just the right ending the author, Lois Lowry, left us with. Read THIS before you read any new dystopian literature (along with Fahrenheit 451 of Ray Bradbury). We all need to be startled with extreme measures sometimes to not take for granted our existence. Of the 5 books I own in this 50th anniversary series, this is my second best favorite (my top pick being Beautiful Chaos featuring the 10th Doctor, a review I still haven’t written yet because I need more time to reflect on it). In this story, the enigmatic 9th Doctor was travelling with companions Rose and Capt. Jack when they noticed a cosmic disturbance caused by a “rip engine”. They land the TARDIS in 21st century Bromley where they discover a Neanderthal alive in present time. Yes, a Neanderthal who supposedly existed Before Christ was found sleeping (tranquilized) in a hospital. His name is Das, and unfortunately for him, his relocation to present time means that he can’t go back in pre-historic days because it would change history (his disappearance is a fixed point in his timeline). Since the Time Lord can only observe or participate in history but not change it, he and Rose went back to Das’ time while leaving it to Capt. Jack to enculturate the Neanderthal to modern technology and ways of society. Surprisingly, our main protagonists found homo sapiens like them (at least like the Doctor in human form because we know he’s actually something else) living in the B.C. time, eerily perfect genetically and chemically. Their genome has been tweaked for all the best physical features to be dominant, and their scariest peculiarity is that they have a sort of emotion-inducer device that with only an input of a code or combination will program their bodies to feel only calm and happiness…to a very disturbing fault. This is called the Osterberg experiment where the brain has all been mapped and figured out for its full potential, but each experiment is programmed to avoid what makes up the human condition: feelings of pain, anger, resourcefulness, and desire because these “threaten” to imbalance the tranquility and harmony of a community. Pretty alarming, huh? This is the only story so far that even touches on a plausible socially and scientifically relevant theme, which makes it more terrifying as I was reading it because how inhuman the world would be with controlled features and emotions! No quirks, no passion, no variety in the populace? Now that’s abnormal. The title of the book is what sums up the idea for this adventure. It highlights the wacky candidness of Rose and the 9th Doctor, and Das’ observation of Capt. Jack will certainly give you a chuckle. 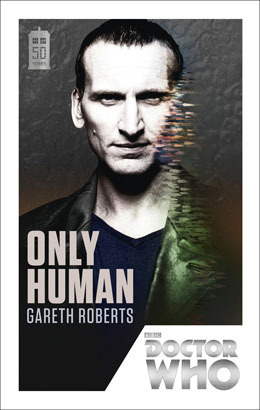 Whovians, you have to read this book! It’s funny, it’s action-packed, and it will leave you with questions about humanity and evolution and how being almost perfect and totally rogue as an individual has its upsides and downsides. That sounds like our every day existential struggle, don’t you think? SUPER EXCITED TO SEE THIS! I bet Tolkien fans around the world got the creeps hearing Smaug’s voice (Benedict Cumberbatch) for the first time. That voice is just terrifyingly awesome. I re-read The Hobbit a few months back, but I can’t seem to fathom why there is a love angle between Tauriel and Legolas. I don’t remember that in the book! Maybe I need to re-read it for the fourth time. All of these Peter Jackson movies never fail to make the battle scenes epic. Can’t wait!